It’s easy to wax nostalgic about old technology--to remember fondly our first Apple IIe or marvel at the old mainframes that ran on punched cards. But no one in their right mind would use those outdated, underpowered dinosaurs to run a contemporary business, let alone a modern weapons system, right? While much of the tech world views a two-year-old smartphone as hopelessly obsolete, large swaths of our transportation and military infrastructure, some modern businesses, and even a few computer programmers rely daily on technology that hasn’t been updated for decades. If you’ve recently bought a MetroCard for the New York City Subway or taken money from certain older ATMs, for instance, your transaction was made possible by IBM’s OS/2, an operating system that debuted 25 years ago and faded out soon after. A recent federal review found that the U.S. Secret Service uses a mainframe computer system from the 1980s. That system apparently works only 60 percent of the time. Here’s hoping that uptime statistics are better for the ancient minicomputers used by the U.S. Department of Defense for the Minuteman Intercontinental Ballistic Missile system, Navy submarines, fighter jets, and other weapons programs. Those systems, according to the consultants who help keep them going, will likely be used until at least the middle of this century. Here are a few stories of the computers that time forgot, and the people and institutions that stubbornly hold on to them. Sparkler Filters of Conroe, Texas, prides itself on being a leader in the world of chemical process filtration. If you buy an automatic nutsche filter from them, though, they’ll enter your transaction on a “computer” that dates from 1948. Sparkler’s IBM 402 is not a traditional computer, but an automated electromechanical tabulator that can be programmed (or more accurately, wired) to print out certain results based on values encoded into stacks of 80-column Hollerith-type punched cards. Companies traditionally used the 402 for accounting, since the machine could take a long list of numbers, add them up, and print a detailed written report. In a sense, you could consider it a 3000-pound spreadsheet machine. That's exactly how Sparkler Filters uses its IBM 402, which could very well be the last fully operational 402 on the planet. As it has for over half a century, the firm still runs all of its accounting work (payroll, sales, and inventory) through the IBM 402. 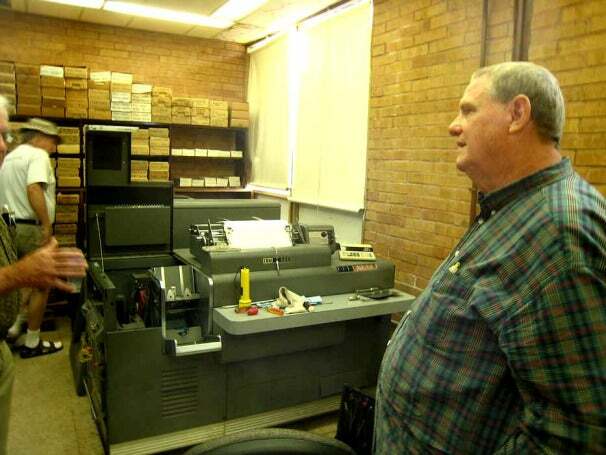 The machine prints out reports on wide, tractor-fed paper. Of course, before the data goes into the 402, it must first be encoded into stacks of cards. A large IBM 029 key-punch machine--which resembles a monstrous typewriter built into a desk--handles that task. Carl Kracklauer, whose father founded Sparkler Filters in 1927, usually types the data onto the punch cards. The company sticks with the 402 because it's a known entity: Staffers know how to use it, and they have over 60 years of company accounting records formatted for the device. The key punch isn't the only massive accessory in Sparkler's arsenal. The 402 also links to an IBM 514 Reproducing Punch, which has been broken for three years. 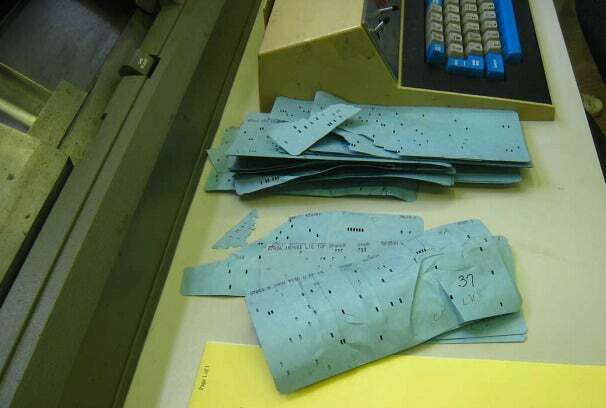 When it works properly, the 514 spits out punched "summary cards," which typically contain the output of the 402's operation (such as sum totals) for later reuse. Sparkler stores all of its punched data cards--thousands and thousands of them--in stacks of boxes. The company also possesses dozens of 402 programs in the form of IBM plugboards. Computer programming in the 1940s commonly involved arranging hundreds of individual wires in a way that would likely drive a modern software engineer insane. 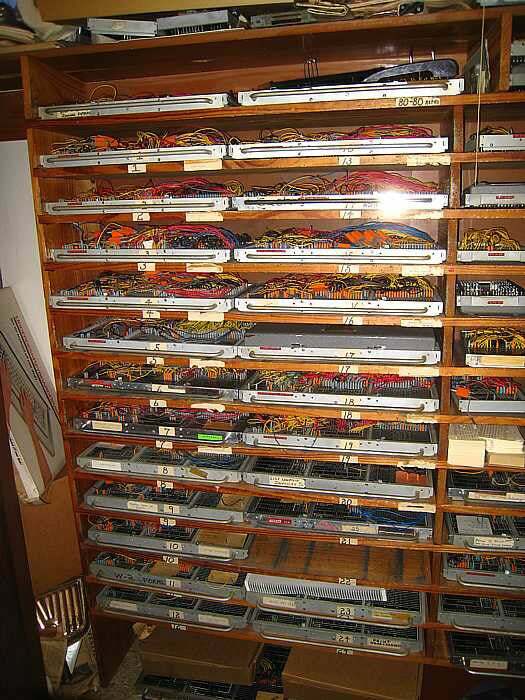 In the 402's case, a spaghetti-like pattern of wires attached to hundreds of connectors on each plugboard determines the operation of the machine, and different plugboards can be pulled out and replaced as if they were interchangeable software disks. So you might insert one plugboard for handling, say, accounts receivable, and a different one for inventory management. Sparkler’s 402 is a such a significant computing relic that the Computer History Museum in Mountain View, California, sent a delegation to the company last year to try and convince its executives to move to a more modern accounting system and donate the 402 to the museum. That will someday be an appropriate resting place for the 402, but as long as it still does its duty, the Texas company has no problem keeping its digital dinosaur living a little while longer. Next: Modern military weapons run on ancient minicomputers.